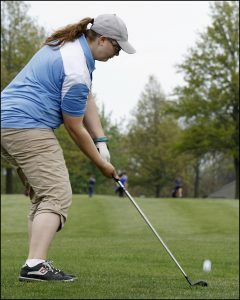 On Monday, May 8, the Hawk girls golf team competed in the SICL Conference Golf Meet at Oakland Acres Country Club. The Hawks finished in fifth place out of the eight schools competing in the tournament. “I thought we played fairly well for how tough the course was. I would’ve liked to place a little higher, but golf is a game of day-to-day,” said L-S Coach Justin Hagedorn. Senior Kaylee Van Maanen hits the ball during the conference meet where she placed 20th individually. The L-S girls shot a 469 on the 18-hole course. They finished 20 strokes shy of English Valleys and beat HLV by 16 strokes. Iowa Valley won the tournament with a team score of 387. Senior Kaylee Van Maanen shot the lowest score for the Hawks with her 113. Her round was short of the medals by eight strokes and put her as the 20th golfer in the SICL. “It was a really nice day to play a round of golf. I thought I did really well on a tough course,” said K. Van Maanen. 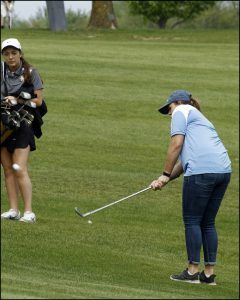 Her sister, sophomore Tessa Van Maanen, placed second on the team with her round of 114. Seniors Mikayla Smith and Kristine Jaennette shot 120 and 122, respectively, in their final conference meet. Sophomore Kayla Van Dyke’s round of 147 didn’t count in the team score. 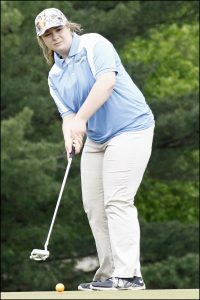 L-S senior Kristine Jaennette hits a chip shot on her way to carding a 122 at Oakland Acres on Monday. She rounded out the L-S girls’ team score of 469 in her final conference meet. The Hawks will compete in their regional meet at Sigourney Golf and Country Club on Monday, May 22. If the Hawks get second or better, they’ll automatically qualify for state. If they get third place and host school Sigourney wins the tournament, that would also qualify the Hawks for state. Sophomore Tessa Van Maanen strokes a putt at the SICL Conference Meet on Monday. Van Maanen had the second lowest round for the Hawks in their fifth-place finish.